I read this in a student paper today: “As I loved music, I asked my parents for an iPod.”Even though the sentence is correct, I suggested that the student replace as with since or because. My concern with the student’s sentence is simple clarity. As not only has eight definitions as a conjunction, but three as an adverb and two as a preposition. It can even be used two different ways as a pronoun. And according to wordcount.org, it’s the 18th most commonly used word in English. The problem here is that the use of as as a synonym for since is relatively rare. It is much more common to use it as a preposition or an adverb. When I first read the clause “as I loved music” I assumed as was the adverb meaning like. I therefore anticipated the sentence would end with a comparison — something like “As I liked music, so I liked hog calling.” When the sentence ended with “I asked my parents for an iPod,” I was confused and had to reread before I realized my error. I had taken it for something of a garden path sentence. Be assured, the error was mine as the reader, not the writer’s, since he used the word in a correct manner. But since both because and since are synonyms, and are defined narrowly enough to prevent any confusion, I felt the writer could do readers like me a service by substituting. In fact, I recommend that all writers avoid this particular use of as. You have two perfectly good alternatives. 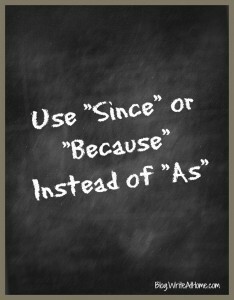 Go with since or because. Garth is crazy as a loon. Stan is disguised as a fire hydrant. My rules, as noted below, are extensive. The child looked as he were guilty. Your toes are as big as bullfrogs. She played as I slept. Unusual as it seems, that penguin can whistle Beethoven. He is wearing the same bow tie as I. He has been walking, as is apparent from the mud on his shoes. Comments? Please leave yours below.